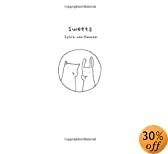 Made available in the English language through Winged Chariot Press, a unique publishing venture supported by the Arts Council England and aimed at brining European picture books to the English market, ‘Sweets’ is Dutch author, Sylvia van Ommen’s debut picture-book. It’s two-tone appearance is misleadingly unadorned and simplistic, for though instantly accessible, there is nothing simple about this narrative! Joris and Oscar are friends who arrange to meet together in the park to share sweets and drinks and to ponder and share their thoughts and beliefs. Close examination of the home environs and world-views unique to both friends show us that Joris is drawn towards function whereas Oscar is drawn towards aesthetics. These differences are indicative of the class antagonisms and struggles that Marx and Engels outlined within their ‘Communist Manifesto’ but union is enabled between the two because of technological advancement ‘ both friends are able to communicate with one another through use of mobile telephony. So begins the friends’ eschatological enquiries about heaven, acceptance into an after-life, familiarity and of the unknown. If this sounds pretentious or outside the realms of the plausible for a picture book, at heart this is a deeply perceptive and sensitive story about the relationship between two friends, that relationship’s endurance and its respective partners’ ability to share. It should be obligatory to read “Sweets”‘ it makes an excellent talking point which spring-boards to some fascinating debate. Here, in truth, is a book worthy of a cult following! Catnip are a new publishing venture incorporating the established Happy Cat Books list. One of many exciting publications featured within their list this year is the award-winning Jackie French’s ‘Callisto’ series. Perhaps most familiar to readers in the UK as the author of the thought-provoking ‘Hitler’s Daughter’ Jackie French is an author whose breadth and diversity of work frequently broaches territory that is both challenging and uncharted! Billed as a comedy and whilst being genuinely humorous, ‘The Caf’ on Callisto’ is as much a poetic treaty on the role the natural environment plays towards the healthy development of children. Sam and her dad live in a future Earth, twenty-five levels beneath the ground. They live not only in the darkness beneath the ground, but also in the shadow of the tragedy that befell Sam’s mother, an event that lead to the impetus for transporting the family towards the stars to be lost. All of this alters when a caf’ becomes available on Callisto 4 and Sam and her chef father are able to claim residency in this brave, new inter-planetary world! Together the pair must make their living through selling food on a planet where food and its sharing is a cultural way of life’ Will they succeed and be able to carve a living for themselves? Exposition on nature versus artifice and the eventual need to escape Earth to attain towards the natural locates the novel firmly in the realm of simulation and simulacra which Baudrillard hypothesised as constitutes of the hyperreal. Here is a science fiction work that glances forward to see the importance of our pastoral pasts’ Fans can look forward to its sequel ‘Space Pirates on Callisto’. ‘The Crunchbone Castle Chronicles’ is a new series of engaging easy-reader novels published by A & C Black and written by Karen Wallace. This humorous series, opening with ‘King Cudgel’s Challenge’, marks a departure for Wallace from the deeply sensitive, character-based novels that explore issues of memory and identity for which she ha become most renowned. King Cudgel has a problem ‘ or rather a pair of problems ‘ his trouble is twins, the positively petulant Prince Marvin and Princess Gusty Ox. Their reign of terror and terrorisation runs amok through the palace raining on reigning King Cudel’s parade. At his wits end Cudgel invites his court wizard, pleasingly-onomatopoeically-named-Crackle, to set a challenge for the right royal sibling rivals and both pace and plot pick up with satisfying swiftness as completion of the challenge is attempted. Will Prince Marvin and Princess Gusty Ox ever get on? Will King Cudgel’s dream of a royal retirement to a place overlooking the sea come true and most unnerving of all, if unsuccessful in their efforts will Godric the Geek ascend to the throne at Crunchbone Castle? 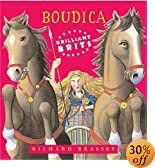 Richard Brassey’s ‘Brilliant Brits’ series continues with its eighth title, this time focusing on formidable Queen of the Icini, Boudicca. As with other titles in the series the book begins by exploring popular facts ‘ and sometimes fallacies ‘ about its subject. Then begins its account proper, pieced together from accounts by Roman historians Tacitus and Dio and corroborated through findings of archaeological artefacts. Brassey’s illustrations have been carefully researched and provide a wealth of background detail that populates and brings to life the time and world-views surrounding Boudicca. Where this book is excels is in its clear presentation of the facts which are equalled with a consideration of historical accuracy and bias that must underpin theory of the subject. Facts are as easily digestible here as they are accessible, a welcome addition to the collection and one that will readily augment the study of the Romans, a key component on the National Curriculum history syllabus for key stage two pupils. Despite the promise of the title, there’s not a whiff of a crime for at least six chapters. Instead leisurely scene setting and character introductions fill the pages. But if you can get through the slow start, you’ll be rewarded by some engaging situations and unexpected plot twists. Katie starts boarding school hoping to have adventures. Night-time expeditions investigating rumours of mad nuns, and the mystery of an orphan girl who claims that her mother is really a supermodel, provide the excitement she craves. The story is told in the first person. Katie’s chatty tone and frequent reflections on the world could either amuse or annoy. Stereotypically, teenagers speak with limited vocabulary and frequent repetition. Katie Milk’s voice has this real life ring, which makes for an easy read, but also means descriptions are not as rich as they might have been. Occasionally, Caulfield seems to have used Katie’s youthful inexperience at narrating to cover some slightly awkward plotting. ‘Now, I expect you’re not supposed to do this ‘ to say about things going on that you didn’t know were going on at the time ‘ but I think it’s important for you to know the thing going on at the time that I didn’t know was going on at the time” This didn’t work for me. What did work though were the well observed details which brought characters to life ‘ hair flicking Danielle was a particularly convincing show-off. Secrets and lies surrounding key characters add a puzzle element which readers will enjoy trying to untangle. And the resolution succeeds in tying all the loose ends neatly together, whilst still being unpredictable.